Just as quickly as the authors of Unshelved had finished their comic sequence, Pimp my bookcart, fans started sending them emails telling them how they were going to actually do the program at their library. 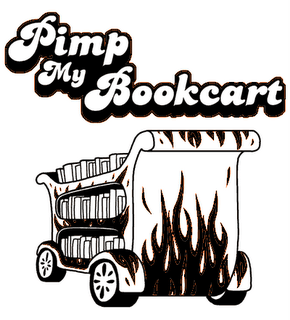 They thought it was such a great idea, there is now an official “Pimp My Bookcart Contest” on the Overdue Media website. The contest lends itself to the perfect programming opportunity for Young Adult Librarians. It’s a chance for their teens to take a piece of library equipment and really have some fun with it. In the end, not only does the YA have their very own bookcart, but they also have a chance at winning $250 worth of merchandise from the Overdue Media Store as well. All entries will be posted on their site. Exactly how many shirts of this Pimp My Bookcart logo t-shirt (left) could I wear in a week!? A brand is a customer’s perception and an expectation of receiving something. This got me thinking: What are my perceptions and expectations of the various businesses that I interact with? My perception and expectation of Commerce Bank is, I never ever have to interact with a human being to accomplish my business. Yay! (and I’m an extrovert) But on those rare times that I do want to actually interact with a teller or service agent (or whatever they call themselves — I just noticed, I don’t really care), I’m going to be treated by someone with a smile. No charge to dump my jar of pennies in the “penny arcade” and convert my spare change into crisp twenties. Nice touch! My perception and expectation of Petro used to be, a big headache, long waits on the phone, disconnects, arguments, mistakes in billing, a freezing home and no service. Just before I hit my limit with this crappy service, a friendly and helpful Petro service agent told me that they were overhauling their phone system, that it was a big nightmare but it was almost done, and PLEASE PLEASE hang in there with them. Now: I expect, no wait on the phone, quick, friendly service at any time of the day or night, a nice website where I can manage my account and — YAY! — request an oil delivery without having to pick up the phone or deal with a voice menu. Thanks for turning it around Petro! Our customers’ perceptions and expectations of our libraries are… [fill in the blanks] Am I copping out by not telling you my perception/expectation of my library. Uh, yes I am. Truth is, I am a member of two libraries and spend time in countless others. I get great service and really enjoy the feel of being in most of these libraries (and I always have–that’s why I became a librarian. Duh.) Lots of smiles, lots of face-out merchandising, coffee, nice nooks to sit in and read or think. Generally, my satisfaction with the physical experience of being at these libraries exceeds my satisfaction with my virtual experience. Libraries, get thee to a web designer! So what do your customers expect and perceive when they visit your library or website? What experiences are you offering them? Second Life, an online virtual world created by Linden Labs in California, has gotten the attention of librarians from all types of libraries. The Second Life Library 2.0 Grand Opening this past weekend was a rousing success, despite a few technical glitches on the “main grid” or 3-D world, which appeared to be system-wide. The Info Island Second Life Library 2.0 has a central blog at http://infoisland.org, where you can also check archives for development of the world and discussion of all of the library events held there, including book talks, instruction, reference, and more. Lori Bell and the Alliance Library System in Illinois are spearheading this venture. Her folks submitted their Second Life Library Project to Talis’ Mashing Up the Library competition and won 2nd place!! Serious Games has discussed library services in SL as well. Other Second Life Library “branches” are cropping up, including a 19th Century Library, Caledon, and a medical library. Great photos of these places and more appear in the library’s Flickr photo pool. A teen “grid” is in the works at http://teen.secondlife.com/ for those under age 18. Metaverse Messenger, the “newspaper” of Second Life, is a real newsprint publication (for ironic purposes, perhaps, but I’ve seen it with my own eyes!) which is also available online (teen and adult versions). Check out Wikipedia’s background and technical info, and more importantly the critical analysis of SL issues and services links at http://en.wikipedia.org/wiki/Second_life Better yet, teleport there now! Bringing Teens on Board – literally! In 2005 Princeton Public Library expanded the roster of its Board of Trustees by appointing two Teen Liaisons to serve a 2 year term. Although they are not voting members of the board, they attend meetings and are given a voice. Their input is sought and their opinions valued. We’ve had a very active Teen Advisory Board (TAB) at PPL for about 9 years. When we were still in the construction phase of our new building, I organized several tours of the not-yet-opened library for members of TAB to get a preview of the new building. These tours were just like the ones that were being offered to the trustees, staff and other interested adults. Alex White was one of the teens on a tour and he became the first of two teens appointed to the board a few years later. Our assistant director at that time was leading the “hard-hat tour” and answering questions from the teens, and I remember it was Alex who asked about who made all of the decisions about building the new library and how to get the money to pay for it. We told him it was the Board of Trustees, and he then asked how someone got to be on it as he was interested. The connection was definitely made that day between teen’s current participation on the TAB and maybe, one day, their being a representative on the library board of trustees. As it turned out, this initial conversation evolved into why not make a space on the board for teens now. Thanks to Alex’s suggestion ( and his reminders over the next year or so about his interest in serving as a teen representative) and to Leslie’s and the board’s desire to take it forward, we now have two teens (both named Alex!) on the Board of Trustees. I recently conducted an email interview with Alex White about his experience as Teen Liaison to the board. Both our teen liaisons accompanied the PPL delegation to New Orleans for Leslie’s Inauguration as ALA President where they presented a gift to Leslie on behalf of the board. 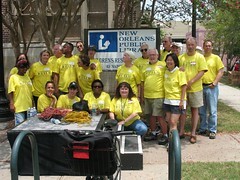 They helped with the “Libraries Build Communities” volunteer day too — they are the young faces in the front row of the group photo of the PPL staff, friends, and board members who traveled to New Orleans in June and spent a day at the Children’s Resource Center moving books (as evidenced in the other photo, where one Alex is passing books to the other). JanieH: Where do you attend school and what grade are you in? AlexW: I attend Princeton High School and am a senior this year. JanieH: How long have you been involved at the Princeton Public Library? AlexW: I have been coming to the library since I moved to Princeton in first grade. I first joined the Teen Advisory Board in fifth grade. JanieH: What made you decide to accept the position of being Teen Liaison to the Board of Trustees? AlexW: I accepted the position because I felt that it was a unique opportunity to influence the library and how it is run. I was interested in offering a teen’s perspective on what goes on in the library. Being able to represent the youth age group is important; it gives us a voice in the operation of the library that might not otherwise be heard. JanieH: What did you hope to accomplish during your term on the Board? AlexW: I basically hoped that I would be able to ensure that the library continues its success in the teen department, as well as making any suggestions that I or other teens feel could help to make the library even better. JanieH: What did you learn as a result of this unique experience? AlexW: This experience showed me how a professional board is run, and gave me the opportunity to see what goes into the operation of a major organization. JanieH: What is the one thing that surprised you most while attending the meetings of the library board? AlexW: I was just a little surprised by some of the things the board discussed, which I would not have expected to factor into how the library is operated. JanieH: What is your most memorable moment from your time as teen liaison? AlexW: I really enjoyed the New Orleans trip, getting to see the city, and being able to volunteer and be part of a team that accomplished something so significant. JanieH: Do you think you will continue to serve on other boards or continue with volunteer work? If so, what do you have planned or hope to do? AlexW: Although I’m not sure where, I do expect that at some point in my future, I will serve on another board. As for volunteer work, I definitely plan to pursue it, but am unsure in what ways. JanieH: What are your plans for the future? AlexW: Well, I’m not sure exactly what my plans are, but I definitely plan on going to college, and after that, hopefully getting a job in the sports industry or being a businessman. JanieH: Who is your favorite author or what is your favorite book? AlexW: I have many books that I enjoy so it’s difficult to pick a favorite, but for now I would have to say The Great Gatsby by F. Scott Fitzgerald. JanieH: Would you share with us a favorite quotation? JanieH:Is there anything else you would like to share about you? AlexW: I am a huge sports fan and also I hope someday to come back and see the library even better than it currently is. I would like to thank Alex White for taking the time to answer my questions. Both Alex’s have been terrific assets to the Board and very dedicated to attending meetings and other functions. I am sure they will have much success in all their future endeavours. The library is currently formalizing the method by which two new teen liaisons will be selected once the Alex’s are finished their term. We have also recently appointed two teen representatives to serve on the Friends Council and be active with our Friends of the Library. Getting teens “on board” makes sense in so many ways and is a great way to train future leaders who will have experience serving on volunteer boards and contributing their time to the community. I hope that other libraries will consider getting their teens “on board” too. Using Library Thing for Reader’s Advisory! John Klima, the Teen/Systems Librarian at the Franklin Township Public Library in Somerset NJ, recently blogged about his podcast on SLJ.com that details how he is using Library Thing as an RA tool for teens. What a great idea — simple to set up, relatively easy to maintain, and (best of all) free. Thanks for sharing John. I am going to file this under great ideas to steal. On a side note, last year at this time John was working for me as a library intern during his last semester at SCILS, Rutgers University . I could tell from his short stint with us at PPL that he was going to make things happen when he graduated. He taught several successful sesssions in our Tech Center on RSS while he was still a student and his tech skills were valued by both staff and library customers alike. In less than a year John has started to make his mark in the library world and I look forward to seeing where John will go next. Keep your eyes on Library Angst for future developments.